Home Investing Time to Invest in Emerging Markets? The following post was written by Ben Carlson from A Wealth of Common Sense. Baron Rothchild once said that “The time to buy is when there’s blood in the streets.” Does that mean it’s time to start looking to rebalance into emerging markets? Investors have soured on emerging market stocks this year. Growth is slowing in these countries, even though it remains higher than the developed economies. Inflation and volatility are rising and the general sentiment is just plain lousy. No one wants to invest in the developing economies of the world right now. I think this could be an opportunity for investors who are comfortable with higher levels of volatility in their portfolio. Things could definitely get worse before they get better, but contrarian or value investors are usually early to buy and early to sell. Since the price you pay for an investment has such a large impact on your final returns, buying undervalued assets when they are hated has been a successful strategy in the past. From the beginning of 2011 through August of 2013, emerging market stocks, as measured by the Vanguard EM ETF (VWO), are down 16.89% while US stocks, as measured by the Vanguard Total Stock Market ETF (VTI) are up a collective 37.38%. This year alone, through August, VWO is down -14.01% even though VTI is up 16.77%. This huge divergence has happened in the past, most recently in the late 1990s when there was a currency crisis in the EM markets. The current trailing one year P/E ratio for the emerging market stocks is about a 60% discount to the P/E of the S&P 500. 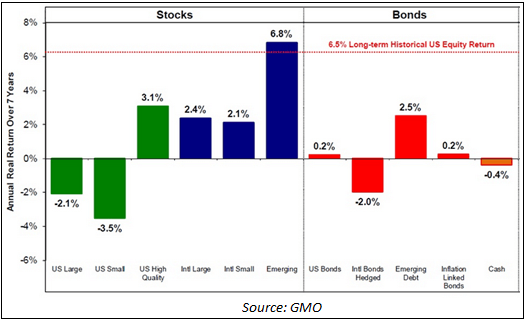 Obviously GMO is not big on US stocks after the large run up since 2009. These numbers are based purely on fundamentals and valuations based on historical relationship and GMO’s future outlook. I’m a big believer in the fact that no one can predict the future, especially of a financial variety, but GMO has been fairly accurate with their long-term calls in the past. You’ll notice that this is not a forecast of the next 3 months or even the next year. Those kinds of predictions are about as accurate as your local weatherman making a forecast for next spring. I can’t promise that buying Emerging Market stocks will be the right move now or next year, but buying hated asset classes when they are undervalued has been a winning strategy in the past. Since these stocks are spread across multiple countries the easiest way to get broadly diversified exposure is through ETFs. This is far less risky and much less expensive, than trading on a foreign stock market directly. Although many discount brokers offer global trading, the ETF route is a much better way to go. 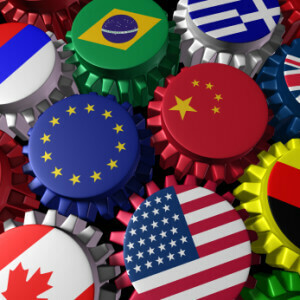 The Vanguard FTSE Emerging Markets ETF (VWO) holds almost 1,000 different companies spread throughout the various countries that make up the FTSE Emerging Markets Index. Another interesting ETF for yield hungry investors is the iShares Emerging Markets Dividend ETF (ticker DVYE). This ETF is made up of over 100 of the top dividend paying stocks throughout the emerging markets. The current yield is over 4% and like VWO, this ETF is also down about 14% year to date. Just remember that historically emerging market stocks have had roughly double the volatility of the S&P 500, so investing in them requires the ability to look past short-term unpredictability. They also offer lower correlation to the developed markets which means that they could zig while other markets zag. Investing in uncorrelated assets can actually smooth your returns over longer periods and allow you to rebalance to those areas of your portfolio that are lagging. Emerging market stocks were up over 7% in September but still look relatively cheap compared to other global markets and offer good long-term value. For those that are nervous about trying to catch a falling knife, you can always average into your purchases over a few months or quarters to spread your risk. Disclosure: At the time of this writing, the author held a position in DVYE. It sure seems like an interesting time to get back into the emerging markets (with the exception of some – such as Brazil and India). I am considering investing in index funds tracking the Chinese economy and just had a post on my blog yesterday. Would you stick to a generic EM ETF such as VWO or DVYE, or would you invest in country-specific ETFs? There will be winners and losers among the countries, but it’s very hard t pick them out especially in the volatile emerging markets space. If you’re going to go the single country ETF route, I would make it a smaller position size and balance things out with the broader ETF to diversify. On the countries you mentioned, it’s true that Brazil is a mess, but for me that makes them attractive as an investment. That’s why it’s so difficult to pick and choose. Hard to know who the winners are going to be.